Nos. 1–5 (1970–73); new series, vol. 1, no. 1–vol. 4, no. 2 (1975–80). 13 issues. Some issues contain phonodiscs. Jerome Rothenberg. Gift Event 2: From Alcheringa. Midwinter Poem 1973. Illuminated by Michael Manfredo after a traditional Seneca Indian beaver clan mask. Folded sheet. 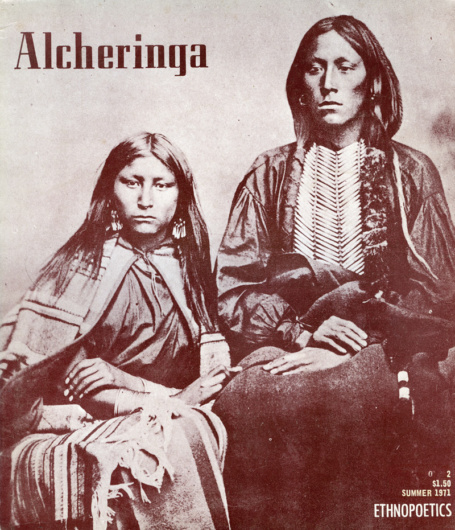 Scans of the complete run of Alcheringa are available on the Alcheringa Archive page at Jacket 2. Record inserts can be found on PennSound.